To make chewy bagel....add less water than other bread. 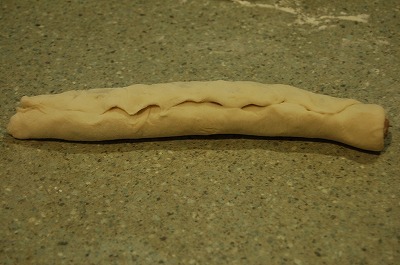 When you knead the dough by your hand, it is stiff. Today, I made Chocolate Marble Bagels for my breakfast. See!? It is marble and shiny crust!!! 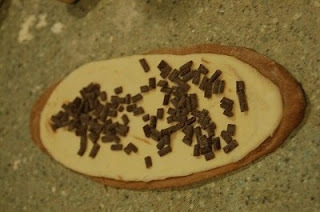 I filled chocolate chip as well. So it is quite sweet, crispy crust and chewy crumb. 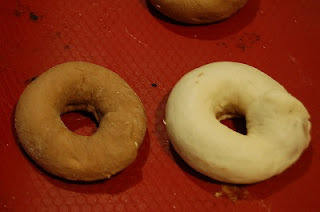 You need to make 2 kinds of the dough, and make double layer. 1. 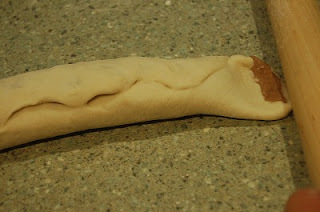 In the mixer or bread machine, combine the all dough ingredientsr. 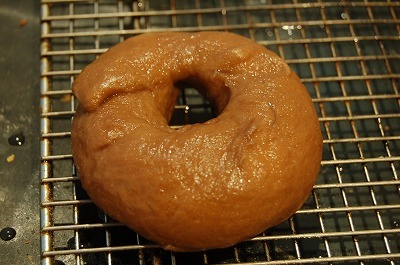 Knead it 10 minutes. It might be stiff at first. 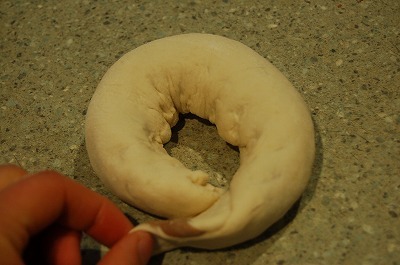 Keep kneading until it get smooth. 2. 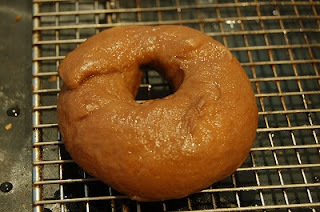 In the small container, combine ☆cocoa powder and water well. 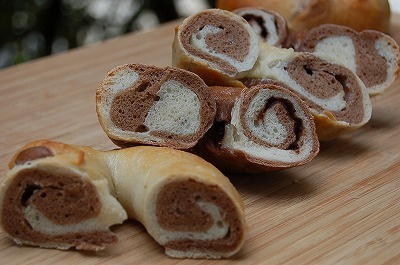 Divide the dough into half (250g each). 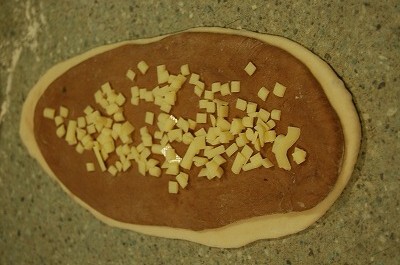 Knead the cocoa and one of the dough together till it is completely combined. 3. 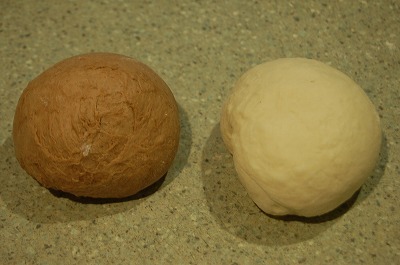 Put these dough into the separate containers, then proof them at warm place (30℃) till it becomes bigger size (about 1 - 1.5 hours). 4. 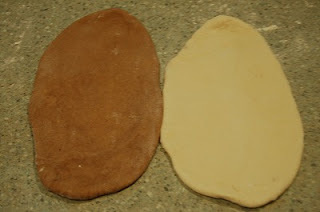 Pour the dough onto the floured counter, then deflate them, knead briefly. 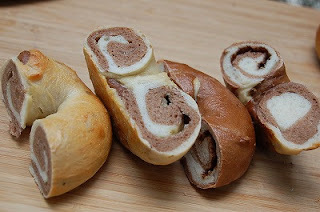 Divide them into 5 pieces (50g each), it becomes 10 pieces totally. Let them rest for 20 minutes with cover. 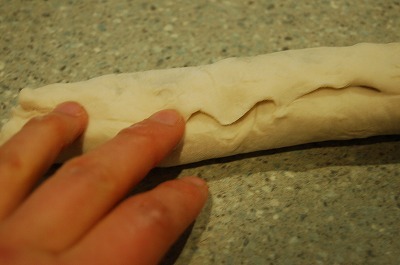 Roll the dough out 20cm x 10cm with rolling pin. Lay the cocoa dough onto the plain dough. Put the white chocolate chips on the top. 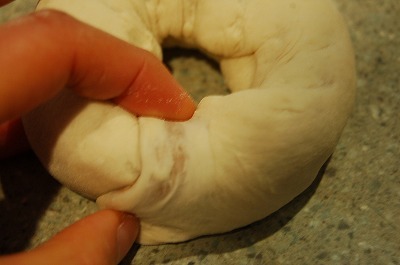 Use your finger tips and seal it tightly. Press the one of the edge with the rolling pin. Make it a circle shape. Cover the edge with pressed side. Seal it tightly. 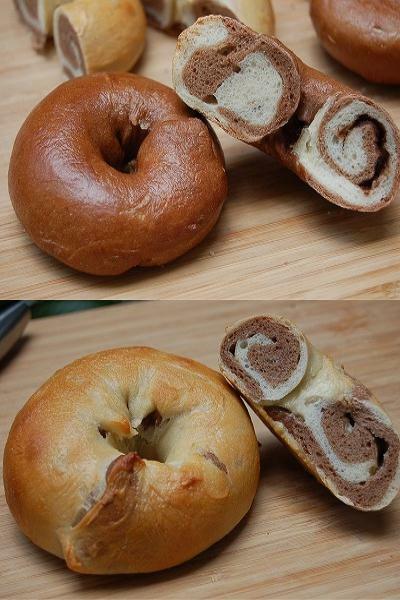 Transfer it on the baking tray. 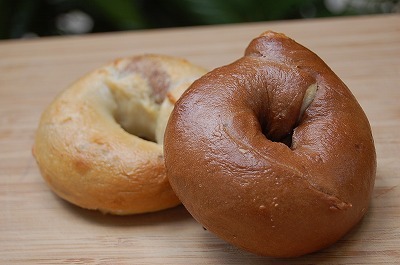 Repeat it, and make other side bagel. 6. Prepare the boiling water with 1 table spoon of sugar in the big sauce pan. 7. Put them into boiling water upside and backside for 30 seconds each. Place them onto a wire lack to dry up roughly for 1minutes. 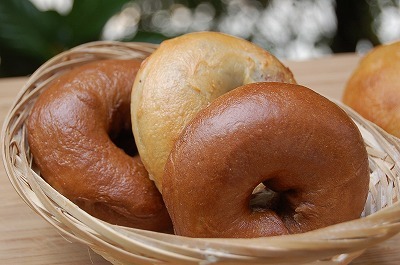 Put them back on the baking tray. 8. 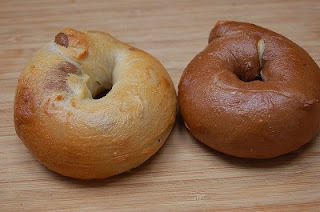 Bake them at 190℃ for 20-25 minutes or till color becomes golden brown.